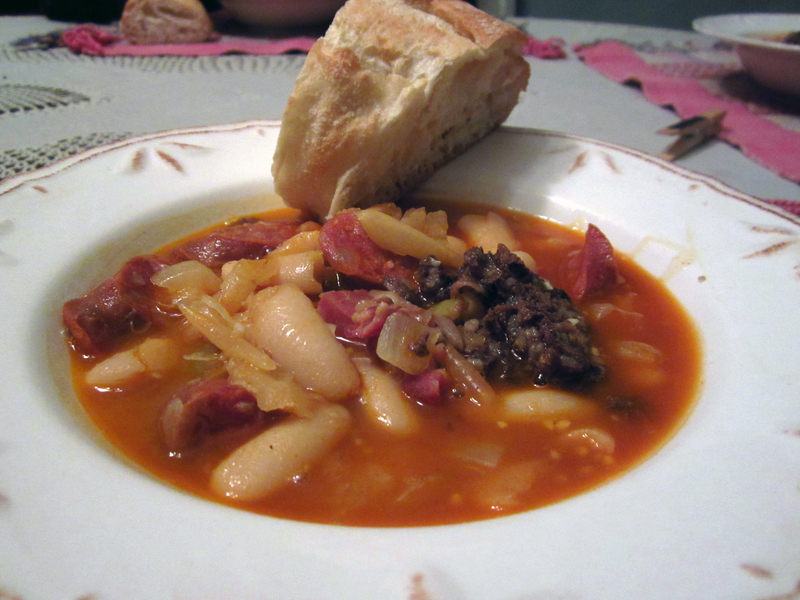 This recipe comes for the Basque area of Spain and is a nice hearty bean soup for those chilly autumn days. Soak the beans for 8 hours in cold water; drain. Add beans and water to a cazuela dish or heavy bottomed pot. Brink to a boil and skim off the foam. Add the saffron and paprika. Cook on a low boil for 2-3 hours. While the beans cook, add the olive oil to a skillet. Add the onion, garlic, ham, chorizo, and morcilla. Brown for a few minutes. When beans are ready, remove one cup of cooked beans and mash them. Stir into the pot. Add the onion/meat mixture. Simmer for 40 minutes. Add salt to taste. Take off heat and let sit for 30 minutes to allow the juice to thicken. Serve with a crusty, warm bread (gluten-free). I love Fabada! Last time I made this I added a branch of rosemary; don’t know whether it is authentic but it tasted wonderful.